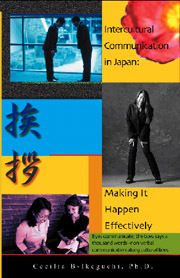 This book analyzes foreigners' cultural adjustment patterns in Japan in relation to the non-verbal code of the "bow" and its corresponding eye movement and hand position. The purpose of this book is three-fold. First, it presents the results of a study on non-verbal communication in Japan. Exploring insights on nonverbal communication is a first step to a successful cultural adaptation in this country. Studies on non-verbal communication have focused largely on descriptive accounts (Klopf & Ishii, 1987) and/or anecdotal reports of culture-specific experiences (Matsumoto, Wallbott & Scherer, 1989)). This work situates the non-verbal communication experiences of people from various ethnic and cultural backgrounds within the Japanese culture, and within the whole context of international communication. In so doing, it accomplishes the second goal: to show the explicit relation between international and intercultural communication. The continued expansion of and interest in these two fields of study, both in research and in the classroom, has given rise to some questions. Some of the most frequently asked questions by students include: "what is the relationship between these two fields of study? ", "are they two separate things?" and "how can we draw the dividing line between them?" No doubt, many books have been written about communication. Some books discuss the different types of human communication: personal, interpersonal, mass and business communication. Chapter 1 introduces "Communication" as a study, and discusses general concepts related to Intercultural and International Communication based on existing literature. It is useful to the classroom teacher and students, as a friendly introduction to these fields of study. An attempt has been done to include some of the major issues to help students understand central concepts in communication studies. These concepts are particularly helpful to beginning students in understanding discussions in the latter parts of the book. At the same time, it can help teachers of Intercultural/ International Communication classes design a syllabus for the course. Chapter 3 presents the results of a study on the adaptation process and problems of two groups of foreigners: the sojourners and long term residents introduced in the previous chapter. 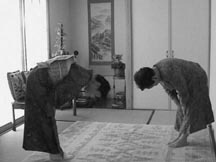 The focus of discussions is on the psychological process of sojourners` adjustment and long-term residents` adaptation in Japan in reference to the nonverbal codes of 'bowing" and "eye contact". To the academicians and empirical researchers, it is the hoped that this chapter will provide useful insights on Intercultural Communication Studies that are culture specific. Last but certainly of equal importance, it will prove a useful guide to an understanding of nonverbal behavior of the Japanese. Thus, to short-term travelers, as well as long-term residents in Japan, this book is a must. Dr. Cecilia B-Ikeguchi, an Associate Professor in Tsukuba Women's University in Japan, has been teaching English as a second and foreign language in various universities well over fifteen years. She has a Master's in English Education and a Ph.D. in Educational Research. Her research interests are on the areas of Second Language Acquisition, particularly Language Testing, as well as on Comparative Educational Systems. Currently, in addition to her teaching responsibilities, she lectures on intercultural studies and serves as one of the associate editors for the International Journal for Teachers of English Writing Skills.